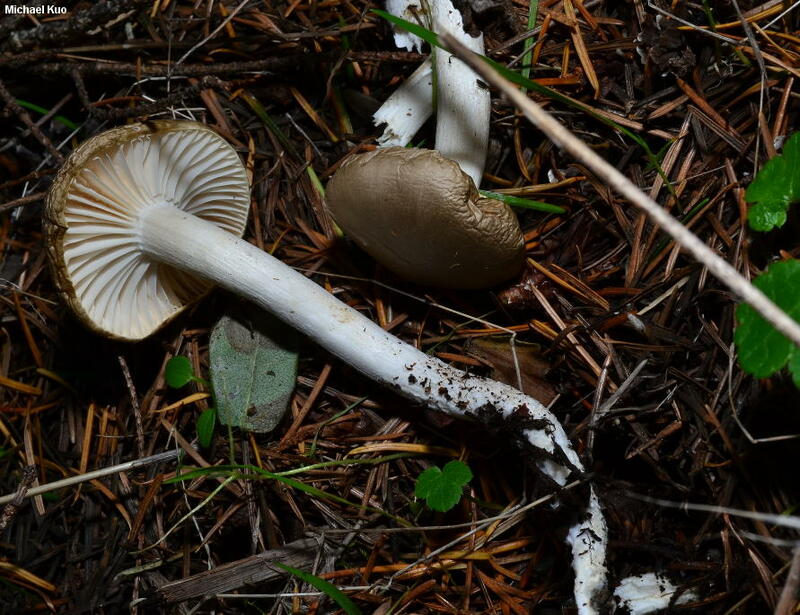 There are several gray to brownish gray species of Hygrophorus, but Hygrophorus agathosmus sets itself apart with an almond odor, a preference for conifers, and a dry, whitish stem that lacks ornamentation. 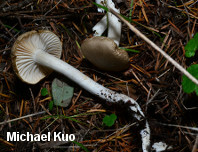 Similar mushrooms include Hygrophorus occidentalis (odor not distinctive, stem slimy) and Hygrophorus pustulatus (lacking the almond odor, stem adorned with fine brown to gray points). Hygrophorus odoratus is a nearly identical but somewhat more slender almond-smelling species found in the Pacific Northwest; it has larger spores (11-14 µ long) and is best separated with a microscope. 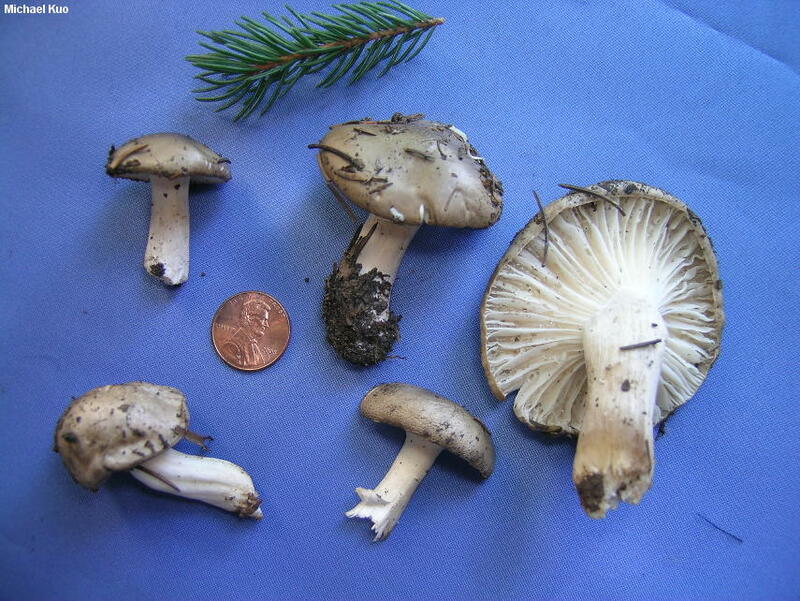 Ecology: Mycorrhizal with conifers; growing scattered or gregariously; late summer and fall, or over winter in warmer climates; apparently widely distributed in North America. The illustrated and described collections are from Colorado and California. Cap: 2-4.5 cm; convex when young, becoming broadly convex or nearly flat; sticky when fresh, but often drying out quickly; bald; brownish gray to gray. 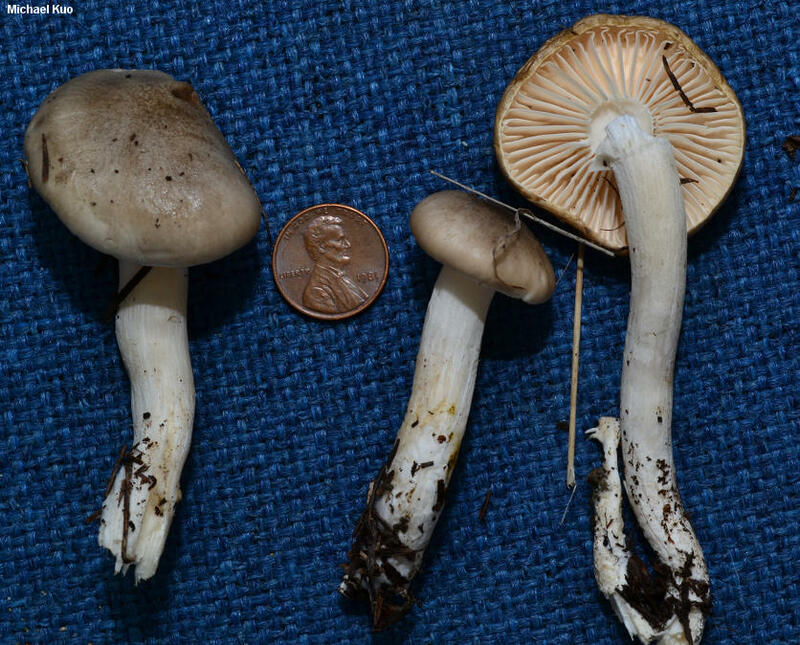 Gills: Broadly attached to the stem or beginning to run down it; nearly distant; white; short-gills frequent. Stem: 4-8 cm long; 0.5-1.5 cm thick; more or less equal, or tapering to base; white to whitish throughout development; bald or finely silky. Odor and Taste: Odor fragrant and sharp, reminiscent of almonds--or occasionally lacking; taste not distinctive. 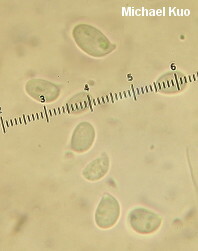 Microscopic Features: Spores 7-10 x 4-5 µ; smooth; ellipsoid; smooth; hyaline in KOH; inamyloid. Hymenial cystidia absent. Basidia 4-sterigmate; 45-60 µ long. Lamellar trama divergent. Pileipellis an ixocutis. REFERENCES: (Fries, 1815) Fries, 1838. (Saccardo, 1887; Hesler & Smith, 1963; Smith, 1975; Bird & Grund, 1979; Smith, Smith & Weber, 1979; Largent, 1985; Arora, 1986; Lincoff, 1992; Barron, 1999; McNeil, 2006; Miller & Miller, 2006; Trudell & Ammirati, 2009; Lodge et al., 2013.) Herb. Kuo 01191305.